INET is a framework widely used under OMNET++ simulation environment which support discrete event simulation for IP based network. We offer INET OMNET++ academic projects for wireless network and applications. We ensure OMNET++ based projects for both college students and research scholars; researchers develop more number of projects on INET framework with wireless network such as wireless sensor network, wireless mesh network and wireless body area network. We design various protocols and perform testing under OMNET++ simulation from ACM papers. INET framework composed of variety protocol implementation among user datagram protocol (UDP), transmission control protocol (TCP), Internet protocol (IP), Internet control message protocol (ICMP) and point to point (PPP). In INET framework it contains number of independent module such as tables, routers, hubs and switches. We determine independent module as simple modules which combined together to form compound modules and network. Compound module in INET framework is referred as standard host compound module composed of complete IP stack with point to point protocol or ethernet interfaces with compound module we produce application such as ping, network layer, transport layer and corresponding applications. Specially designed to simulate all wireless based applications. Ability to use real network address & perform routing based n rules derived from routing tables. Flat network configurations automatically distribute address among host network. We implemented INET in following application and developed more than 90+ projects by our developer team. Testing protocol behavior which require real counterpart. Identification of middle box & routers. We provide overlay network called peer to peer network which require scalable. We ensure direct communication with network node in peer to peer network. We support INET simulation in peer to peer network with memory constraint. We provide protocol such as UDP, TCP, IP and ethernet. We mainly implement wireless sensor network for M.TECH students which is a set of sensing devices communicate wirelessly. Every device in wireless sensor network is sense, process and takes to peers. We provide sensor network with central collection point. We design & implemented MAC protocol to ensure collision avoidance & detection system on wireless sensor network. 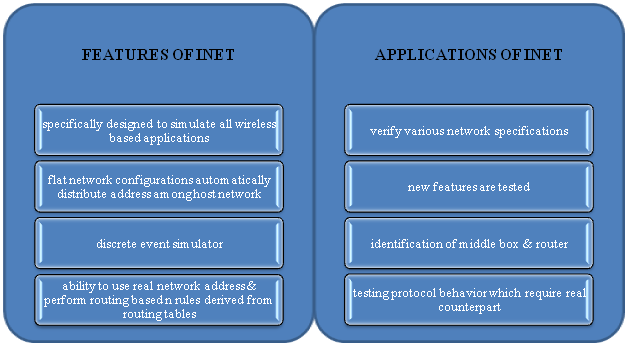 We test protocol and routing methods in wireless sensor network by INET in OMNET++ framework. We establish wireless body area network in medical environment. We design wireless body area network with software & protocol design depends on INET simulation framework under OMNET++. We use medical bonds for wireless system in WBAN to get physiological data from sensor nodes. We transfer the collected data in BAN to remotes with multi hoping technique through wireless gateway nodes.